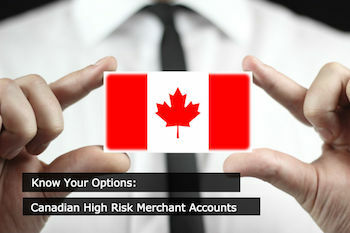 What’s the Best Option for Canadian High Risk Merchant Accounts? So what if your business is considered high risk. You still need the capability to accept payment cards, so your online business can get off the ground next month — not next year. Is that asking too much? Ever since you chose to establish an ecommerce business that falls into the high-risk category, you’ve had to develop thicker skin and more stick-to-it-iveness than previously you thought possible. …Regardless of what you’ve heard, Canadian high risk merchant accounts do exist. So don’t despair. Keep reading and you’ll learn more about the benefits of using a domestic Canadian merchant account provider — tips for success — and how to find one. If you’re looking for cost-effective, reliable merchant accounts consider working with someone who cultivates relationships with domestic banks that are willing to work with high-risk merchants. What you need is an ally to help you tap into local markets. Canadian High Risk Merchant Accounts lead to increased profits for your business. Isn’t that a great reason to seek one out? Lower rates and pricing. Canadian high risk merchant accounts offer cost-effective processing solutions for domestic merchants, when compared to offshore merchant accounts.No cross-border fees will apply (for you or your customers) when Canadian-issued payment cards are used. So for Canadian businesses serving a large percentage of domestic customers, Canadian high risk merchant accounts make good sense. Faster funding times (usually 2-day bank settlement). Some processors set you up with your own merchant account. Others process your business through a joint account — meaning that when transactions are settled, your funds go into the processor’s bank account, not yours.If an irregularity (like fraud) is suspected, the processor holds your funds for the duration of an investigation — resulting in funding delays of several weeks or months. How will your business survive without operating funds? Display your business’s operating name in transactions. When you have your own merchant account, customers will see your business’s operating name on transactions posted to their credit card statements. This reduces confusion that leads to chargebacks, and it increases your brand exposure. Better financial control. With your own Canadian high risk merchant account, you have more control if a customer disputes a charge. You’ll have a 30-day window to provide a rebuttal, not the short timeframe dictated by some processors and payment aggregators. In this instance, time really is money. One thing that’s unique to Canadian merchant accounts is the Code of Conduct for the Credit and Debit Card Industry in Canada. From the Financial Consumer Agency of Canada, the code applies to all payment card networks and their participants. The purpose is to demonstrate the payments industry’s commitment to fair business practices. It aims to ensure merchants and consumers clearly understand both the costs and benefits of credit and debit cards — supports increased pricing flexibility — and allows merchants to freely choose which payment options they’ll accept. Once businesses are up and running with Canadian high risk merchant accounts, protecting the businesses becomes paramount. Merchants beware the many fraudsters — both criminal and friendly — who want to tear down what you’re building. Fraud prevention solutions help eliminate chargebacks, reduce false declines, and protect your business results. End-to-end fraud management goes beyond handling specific events. Ensure your ecommerce website is PCI-DSS compliant. Always require Address Verification (AVS) Card Code Verification (CVV) in your payments gateway. Have a robust, recurring process for to screen your payment gateway for fraudulent transactions. Consider specialized chargeback prevention tools. Manage and improve your customer service processes to retain customers and reduce your chargeback rate over time. You’ll find useful discussion of each of these tips here. Fraud prevention and chargeback protection both impact a merchant’s bottom line profits. Merchants pursuing ecommerce success with Canadian high risk merchant accounts will benefit from taking fraud prevention and chargeback management seriously from day one. High-risk merchant payment processing comes with unique challenges and complexities. When looking for the best Canadian high risk merchant accounts, it pays to work with an expert who knows the payments industry from the ground up. You’ll find that the right processing partner has cultivated great professional relationships with Canadian banks ready and willing to work with you. And banks in other parts of the world too, because many merchants benefit from several merchant accounts to facilitate multi-currency processing when expanding businesses elsewhere. Choose an expert who understands the unique business models of the high-risk ecommerce world. Someone who begins by assessing your unique merchant situation before suggesting the ideal processing structure to support your needs — and who helps you put it in place. What else should you want in a processing partner? Look for a specialist who will act as a digital payments advisor — to help solve problems with fraud or chargebacks when they arise — and with the technology to support your business now and in the future. Hi I would like to apply for a merchant account.